This is an example of how poems can get a little out of hand. For a good rule of thumb, if you don’t remember what a section was about, or what inspired it, consider strongly removing it. That was the situation that caught me with this poem. The back end was a mess, and while there were some strong moments, it was better to just gut it and give it new life. 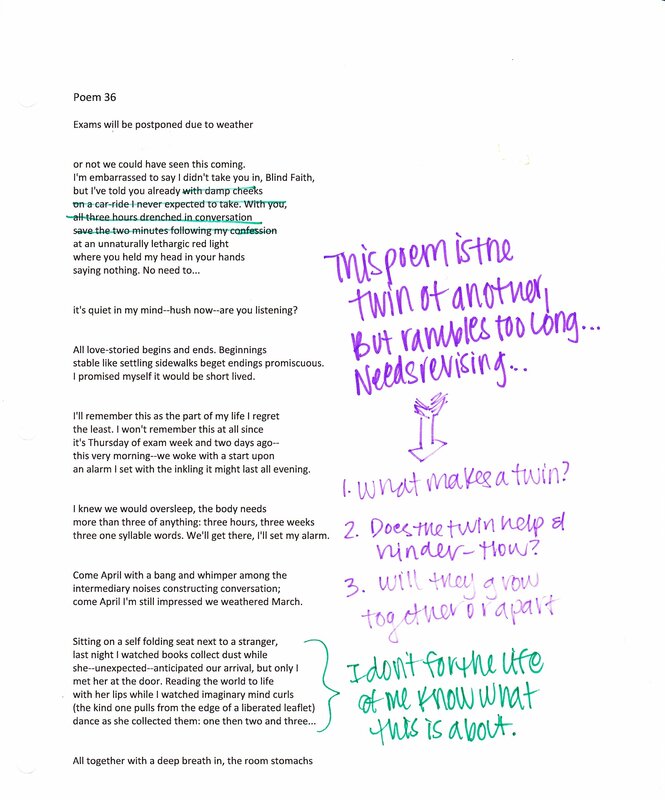 So poem 36 came from a real experience, and to give that experience justice I had to take a lot out of the me-ness and make it more poem-y to bring back life. No one cares about my weird relationship, especially if there really is no real reference and just vague mush. Avoid mush at all cost! 2 – I also beefed up a stylistic element, enjambment, to give the poem a little more pop. So enjambment is the use of a split in a line that would be otherwise whole. Natural enjambment makes for a logically flowing poem. The line breaks at a pause in a sentence or a pause in thought at least, making the reader comfortable to read as if they would speak. Here, the enjambment is a total mess. Not only is it unpredictable, but it also rewrites the previous line. A visiting poet told us, in a class I took at JMU, that there is no reason to enjamb unless there is an exact purpose for the use. Otherwise, the convention is becoming passé with young poets and its use will soon be cliché, so use with caution and drive. Here that is most certainly a consideration, and hopefully put to good use. As my rules go, there will be lots and lots more ways that the poem can change, especially since the new material opens me up to tons of new revisions. But it’s a thought since it needed desperate help. If a poem seems too daunting, try a two-pronged attack: pick a focus and a technique to breathe new life into a poem that seems dead. The two ways of reimagining the piece will help you see new opportunities for change and give you a solid guideline for what is and is not important.